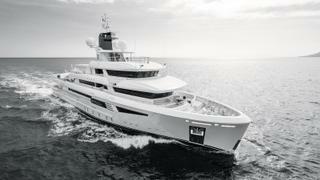 I Nova was a 50 metre explorer, for which we were responsible for the exterior and interior design. The client was an experienced yacht owner with his own ideas about what a large yacht should be: strong, comfortable, reliable and elegant. He wanted us to translate this into reality and we achieved this with a scheme that incorporates both novelty and strength. 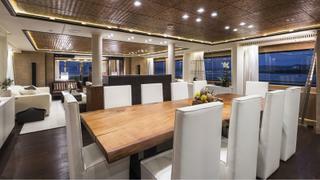 The main saloon sets the tone for the interior design of the entire boat. We used a lot of interesting and exotic materials that referenced the nature of it being an explorer yacht. The ceiling is composed of square panels clad with woven bamboo and, in the dining area of the cabin, there is hand-wrought copper decorating the athwartship bulkhead, designed to echo the surface of an ancient Japanese shield. The dining table was made using a unique slab of kauri wood. It is one of the rarest and oldest timbers in the world and is only found in a small area in the far north of New Zealand. Kauri trees died or fell as a result of earthquakes and other natural events between 30,000 and 50,000 years ago but have remained preserved under the mud, without any decay, until today. The wood has beautiful uneven borders and its surface shimmers with a warm honey hue. 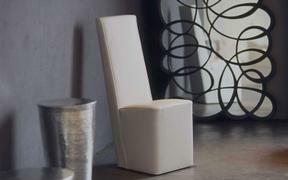 It was handcrafted by Riva 1920 to our design. 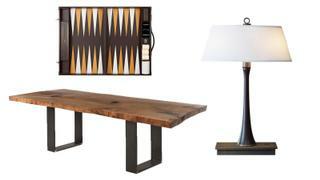 There is also a bar area that features a solid kauri wood counter and leather woven panels. Most of the furniture was designed bespoke by us, although we looked to respected Italian manufacturers like Baxter, Minotti and Poliform for the loose furniture, such as the sofas, armchairs and pouffes, and we used largely Loro Piana fabrics. The thinking was to create a highly evocative setting that was also comfortable and relaxing. The owners spend significant lengths of time on board and they needed a space that would be both practical and pleasant to spend time in.